Sketchfab is a web service to display and share 3D files online in real-time without a plugin. Sketchfab for Autodesk® 3ds Max® makes it easy to publish your model to this platform with just a few clicks. This plugin takes away the hassle of exporting, zipping and uploading your models manually. It can also automatically unwrap your objects and bake materials and lights into new textures. Open the plugin and authorize your Sketchfab account. Fill in a title, description and other metadata. Adjust texture and lighting settings as necessary. elect some objects and press the “Publish” button. The plugin will take care of the rest. Your model will then be opened in a browser. This saves a lot of time as I was use to having to export the model to OBJ and then upload all the textures separately. This can revolutionize the presentation of a project. And it has great potential to expand new tools. This add-on is really easy to use and makes it so easy to share Max models online. With this add-on, no need to open my browser to share my 3D models online. This is perfect to share models with other to get feedback. Cannot be more useful, helping avoiding all hassle in building my portofolio, just uploading directly from Max, no html, no website maintaining. I've been waiting for this kind of tools for years. Publishing on the web is awesome! I've used Sketchfab for over 6 months now, and the exporter has been perfect to let me quickly upload to the site to view my 3d results in real-time. It's really easy to set up and will save you the trouble of exporting your models from max and then uploading them to the site. 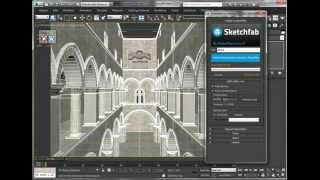 If you use Sketchfab regularly, this is a great time saver.